When the Mercedes limousine crashed in Paris in the early morning of the last day of August, reaction in most of the world dwelt on the terrible fate that had befallen Lady Diana, princess of Wales. But not so in Egypt and the Arab Middle East, where the focus was singularly different. There, the presence of Diana's Egyptian companion, Emad Mohamed al-Fayed (known as Dodi) gave the event a political and religious cast that inspired a far more political media coverage. If Western journalists mused on the purported drunkenness of the driver and how the paparazzi distracted him, their Arabic-speaking counterparts overwhelmingly agreed that "There is no doubt about the presence of a conspiracy behind the death of Diana." Very many Arabic-language publications promoted elaborate and ever-more fanciful theories about the event. What to the world was a tragic automobile accident, to the Arabic press was a plot. Even official bodies joined in this seeming consensus: Libya's National Commission for Human Rights declared that "Only children believe that it was an accident." Conversations with ordinary Arabs suggest these views are widely shared, a view then confirmed by a newspaper poll on the West Bank indicating that 47 percent of its readers believe the young couple was murdered. The conspiracy theories, in other words, are no mere curiosity but a plumb line into the mentality of a people. This makes them worth exploring in some depth. The speculations focus on three issues: why the couple had to be killed, who committed the crime, how it was pulled off. Why was Diana killed? Nearly all conspiracy theories concern Dodi's father and his religion. His father, Mohamed al-Fayed, is a highly controversial Egyptian-born tycoon who lives in London and owns, among other properties, the exclusive Harrods department stores. He has been embroiled in the shady side of British politics and, despite his persistent efforts to win British nationality, has failed to do so. The Arab press seized on this confrontation as an explanation of the dead couple. Clearly, they reasoned, the notion that this foreign upstart should be step-grandfather to the heir of the throne of England was too much for the royal family to accept, so it dispatched the son. Not only that, but the press saw confirming evidence everywhere. The extravagant funeral for Diana, for example, it read as "provides a new evidence about the role played by Buckingham Palace in this diabolic conspiracy." Other explanations reflect Dodi's Islamic faith. Diana had to be killed because the British government could not accept the mother of the future king involved with a Muslim Arab; or marrying him; or converting to Islam; or giving birth to a Muslim son. Simply put, as an Egyptian security guard was quoted saying, "in the West, they hate Muslims." What makes the Arab press so especially intriguing is the manner in which it builds on its own hypothesis, reporting the merest whimsy as solid fact. Some journalists assumed that Diana had already converted to Islam: "Recite the Fatiha [the opening chapter of the Qur'an] for the soul of Diana" read one headline, implying that she was a Muslim at the time of her death. Or another: "Murder was the easiest solution for the British government to deal with a Muslim princess." One account asserted that Diana had agreed to wear the hijab, Islamic modesty clothing, on her head. Others stated as fact that Diana was pregnant by Dodi and the two were soon to announce their plans to marry in November. Dodi and Diana, shortly before their deaths. Diana's presumed pro-Islamic attitude prompted more than a few Middle East journalists to portray her in tragically romantic light. "Diana's life was the price of her love for Dodi" wrote one. Or, Diana was the "martyr of Arab love." The death "ended an Arab mid-summer's dream" commented an Egyptian daily. Some writers made Dodi's Middle Eastern identity central to his appeal. Zulfuqar Qubaysi, a columnist, wrote movingly that "There is no doubt that Diana was impressed with al-Fayed the son and fell in love with him and wanted to marry him because of his romantic Arab nature, because he was Egyptian, Arab, and Muslim." Her decision sealed her life. Who killed Diana? By nearly all accounts, British Intelligence did the dirty deed. Why in Paris? Obviously, to kill her outside Britain and so deflect attention from the British authorities. For good measure, Libyan strongman Mu'ammar al-Qadhdhafi charged French Intelligence with being complicit in the crime. Other suspects mentioned included British racist organizations (which could not stomach Diana's connection to an Arab), some of Mohamed al-Fayed's many enemies, or the enemies of Dodi's maternal uncle, the famed arms merchant Adnan Khashoggi. How was Diana killed? The motorcyclists obviously were not photographers - how can one ride and take pictures at the same time? Instead, a drunk security officer at the Ritz Hotel was deliberately given the car to drive. Or the car was tampered with after having disappeared a year earlier, so it locked in at over 190 kilometers per hour and could not be slowed down. Alternatively, somebody messed with the automobile's brakes, rendering them ineffective. Finally, professional killers were hired to assassinate Diana and Dodi in a "James Bond"-style operation. This kind of behavior reflects badly on the royal family, whom the Arabic press excoriated. The Queen of England, it said, eulogized Diana only after she became a suspect in the assassination. More poetically: "They murdered the Princess and attended her funeral." Nor does the incident show the British in a favorable light. "Racism against Islam," screamed one cover. "English racism till death," read another. Qadhdhafi accused British and French Intelligence services of perpetrating a racist crime against Semites, then drew larger conclusions: "Britain is the basest country in the world." He also demanded that the British "confess that they are criminals, base, and should no longer talk about terrorism and human rights." The Libyan news agency drew the largest implications of all, seeing in this incident "reveals the reality of the Western civilization." Nor were all conclusions theoretical, as some writers found foreign policy implications. The couple's death confirms that Europe is searching for a new enemy after the collapse of the Soviet Union and has decided to launch a religious war; this incident is its first chapter. A Libyan body called for a commercial boycott of Great Britain and France as payback for their governments' complicity in the murders. Why this almost automatic assumption of a plot by Middle Easterners? Several explanations suggest themselves. First, the accusations against the royal family roughly reflect what a Muslim family might do if roles were reversed. When Qadhdhafi accuses the British royal family of staging "an arranged crash" out of pique that "an Arab man might marry a British princess," he inadvertently hints at his own feelings were his daughter to plan to marry a British man. Muslim girls are forbidden to marry out of the faith or marry a social inferior, and the police logs are brimming with cases where families have murdered their daughters or sisters for breaching these cardinal precepts. Right now, a prominent case in Great Britain involves a Pakistan family very publicly intent on killing its daughter for her marriage to a Christian; she and he wrote a book, Zena and Jack, in response. The Middle Easterner's suspicion of foul play in Paris, in other words, projects his own mentality. Second, car and other vehicular accidents take place relatively often in the Middle East. Saddam Husayn, for example, almost killed Yasir Arafat in 1969, when the PLO slighted Iraqi leadership of the Arab cause; days later, an army truck rammed into Arafat's car, breaking his arm. During Saddam's tenure, over a dozen important figures left the scene in like manner, most notably his brother-in-law and defense minister, 'Adnan Khayrallah. After this last incident, the Egyptian president reportedly sent Saddam a letter demanding that Khayrallah's death be the last such "accident." 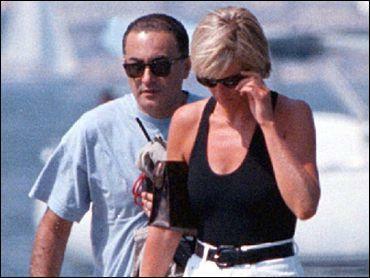 Third, Arab press reports viewed Diana's affair with Dodi as "an Egyptian and Arab conquest of Western territory." What they called "the battle for winning the heart of Diana" entailed not so much a love affair on his side as a political offensive against Christian Europe. One report even described it as revenge for the Dinshaway Incident in 1906 (when the British responded to the death of one of their officers by executing four peasants). An Egyptian caricature portrayed the Diana-Dodi relationship as a 72-hour reprisal operation for Britain's occupation of Egypt lasting 72 years. Such an aggressive view of the lovers' relationship almost requires the British government to reply in kind, making the murder of Diana an almost logical step. Westerners are hardly innocent of similar conspiracy theories. The Internet buzzed with wild speculations. One saw the long arm of munitions manufacturers, incensed that Diana was campaigning for the worldwide ban of land mines, reaching into the Paris tunnel. Another had Diana not dead at all but faking her own death as a ploy to escape the media. One of Lyndon LaRouche publication's called Diana's death an event of "extraordinary strategic significance" because it "shakes the foundations of the world's most powerful institution, the British Empire." (Yes, LaRouche believes the empire still exists.) The LaRouchites are not quite sure who arranged for her murder, but know it has "implications for every being on this planet." These musings in the West remained confined to the far edges of the political spectrum; in contrast, the mainstream Arabic press indulged in outlandish and bizarre theories. Such conspiracy thinking bodes ill for the Arabs in their dealings with politics. It indicates passivity and defensiveness, as well as a wish to avoid participating in a complex modern world. In this mental world, nothing happens of its own, but some nefarious culprit - almost always British, American, or Israeli - stands behind every untoward event. Arabs must leave behind a worldview dominated by conspiracy theories. This means distinguishing between serious analysis and fantasy, fact and rumor, reality and wishful thinking. But this change may be slow in coming, for insecure and repressive regimes have nurtured conspiracy thinking through their media and by suppressing basic liberties, especially freedom of expression. Worrying about possible schemes to overthrow their illegitimate regimes, the rulers have created an atmosphere of perpetual fear that has helped to institutionalize conspiratorial thinking. Moving on to a more responsible and mature form of politics means leaving behind the conspiratorial mindset. Dec. 17, 2006 update: Nearly a decade later, the defnitive police report that refutes the conspiracy theories about the crash has been issued. But the lead conspiracy theorist, Mohamed al-Fayed, refuses its conclusions. For why, see "Diana inquiry: Inside the mind of al-Fayed."